Call your smart friends! We need help to answer these questions from actual readers like you. If you have an answer, you may leave a comment or you can email us at la@curbed.com. Answers shall be posted this Thursday. 1) Larchmont: Seriously, the dirt lots populating the City has reached crisis proportions. 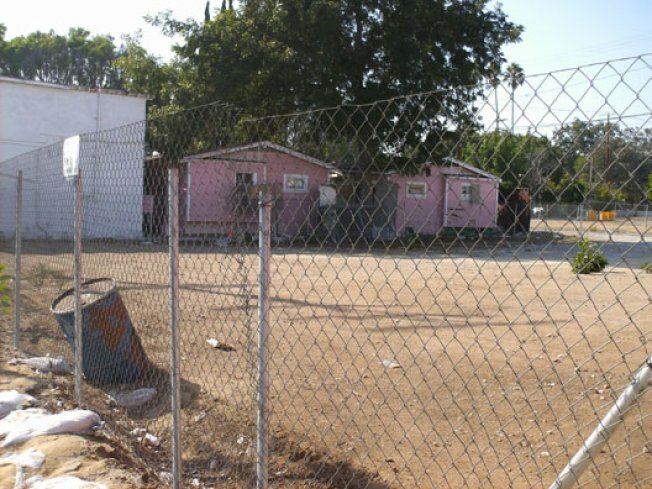 "What's with the vacant lot across from the new Larchmont Lofts (pictured above)? If they filled that hole in, the intersection of Melrose and Larchmont would actually be charming..."
2) West LA: A reader sends a tip/question. What's going on there exactly? "Slow news day, perhaps: on west side of Granville, between Wilshire & Texas, they are knocking down two dingbat buildings, presumably to build evil condos. But they aren't bulldozing. They're de-constructing, plank-by-plank. Either they're goodie-two-shoes, have lots of time on their hands, or the price of recycled 1950's lumber is up." 3) Hollywood: The reviews of the hotel/hostel are not good, so we hope this one gets spruced up. "I have a question regarding the Gershwin Hotel on Hollywood Blvd. A Friend and I went in there on sunday to see what was going on. The lobby was empty and white, more like a gallery. The lone security guard was sitting behind his desk told us that the hotel was closed for remodeling. I searched Curbed for more information but only got something from 2006 and this article from 2005 in LA Weekly. I am curious to what the future holds for that wonderful building."